Once you sign in with your username and password, you'll see our interface. On the left-hand side bar you'll find two modules: Route and Tracking. The selected module is highlighted in red. 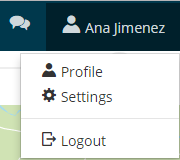 Every time you sign into your account, you'll always see the Route module view by default. Click on Tracking to go to the Fleet tracking module. In the upper right hand corner, you'll find your username. Click on it to see see your Profile information and Settings.